I'm a sucker for sad movies. As a matter of fact, I often judge a drama based on its ability to make me cry. The more weepy I get, the better the movie. If I still cry watching it a second time or beyond, it's an instant classic in my book. (My Girl, you get me every time!) I'm not one of those people who tear up while watching Extreme Makeover: Home Edition or Hallmark commercials, so I feel like my tears are hard-earned when it comes to movies. This movie made me cry on several different occasions, forcing me to eventually pause the movie and plant a tissue box next to me. If you are the weepy type, go ahead and start the movie with tissues and a trash can and save yourself the trouble later on. If you're not into the whole sad movie thing, just ignore this whole first paragraph. There is a reason everyone loves Christian Bale. He is one of those unique people that can play both characters you love and characters you hate. In this movie, he plays both. This is important because that makes his character's growth through the movie believable and interesting, instead of predictable and cliché. The movie is a bit predictable, but not every movie was made for plot twists. 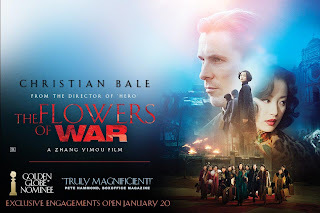 In this case, the straight drama of the storyline and the action of the war scenes is enough to make for a satisfying movie. And the scenes that help define how the invasion of Nanjing got its nickname are almost unwatchable they are so moving (in a horrible, gut-wrenching, peek-through-your-fingers sort of way). Anyway, getting back to Christian Bale. Sometimes having only one recognizable person in a movie - especially a foreign movie - can backfire. I usually either expect them to carry the entire plot, or I am annoyed that I can immerse myself within everyone else's character except that one person because I already know who they are. (Of course, I can't think of a single example to solidify my point, but rest assured it's happened.) Anyway, I bring this up only to say that this movie did not fall victim to this preconceived notion of mine. The Chinese actresses are wonderful in this movie and the lead woman, Ni Ni, is beautiful. I've been accused of being biased toward people of Asian descent, but hey, it's not my fault they're just prettier than everyone else. One of the criticisms I heard about this movie was that some of the characters and plot lines seemed unbelievable and manipulated for additional drama. For example, the point that some of the characters were too flippant about being in the middle of a war with the choices they made. I want to take the time to address this because it goes straight to the integrity of the movie. I don't always get philosophical and deep with my movies (obviously, considering the majority of the movies I watch), but I think whoever made these criticisms is not correctly assessing the characters, their situation, and the era. First of all, these characters work in an industry removed from everyday life (hint: it's prostitution). To criticize some of their actions as being unbelievable is like reading Pride & Prejudice and complaining that none of the characters work for a living; (side note: someone did actually complain to me about this) you need to watch the characters within the context of their time and circumstance. This rant may not make sense without having watched the movie, but I'm trying my hardest not to give away too much of the plot. Final word: If you don't cry at any point watching this movie, you might actually lack a soul.